We fix cracked foundation walls! Permanent repairs for structural cracks using wall anchors, I-beams, carbon fiber and Shotcrete. Foundation wall cracks trigger a number of questions: Is this a structural crack that compromises the strength and stability of the wall? Will the crack get bigger over time? What caused it? Will the crack allow water to leak inside the foundation? What can be done to fix it? Leaving these questions unanswered can cause any homeowner to lose sleep. That's why it's smart to have an expert from Basement Systems look at your cracked foundation. 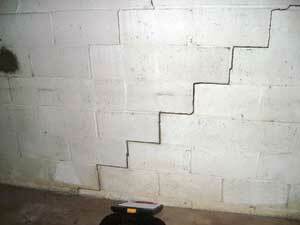 We offer free inspections and estimates on permanent repairs to cracked foundation walls. Call us today or click below to get started! 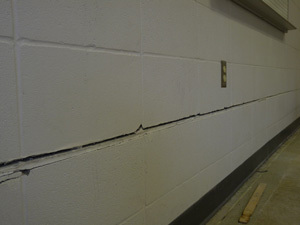 Horizontal cracks are the result of heavy soil pressure. 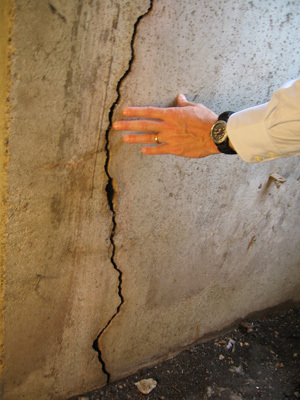 Cracking concrete is common, and a small crack isn't necessarily cause for concern. Vertical cracks often allow water into the basement. Poor construction practices also lead to cracks and seepage. Horizontal Cracks: Horizontal cracks are a serious issue that usually indicate heavy soil pressure. This happens when water-saturated soil is exerting pressure against the wall from the outside. Such walls may eventually bow and buckle, or possibly even cave in. 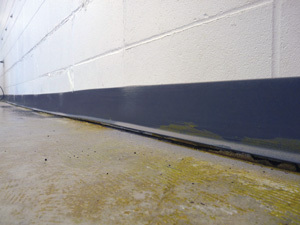 horizontal cracks require immediate repair. Shrinkage of concrete or mortar: These cracks are tiny –too narrow to admit your fingernail. 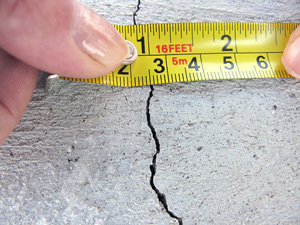 Shrinkage cracks don’t change size and don’t diminish the strength or stability of the foundation. Soil settlement: If some of the soil beneath a foundation wall compresses or is washed away due to heavy rain or a water leak, the wall (and its footing) can crack vertically and settle into the depression. Soil pressure: Outside the foundation, expansive clay soil or water-saturated soil can push in on a foundation wall with great force. If this pressure is too great for the wall, it can develop horizontal and/or diagonal cracks. Cracks are often accompanied by wall displacement in the form of bowing or tilting. Construction defects: Inadequate reinforcement, weak concrete and undersized footings are some of the construction defects that can make a foundation wall more prone to cracking. With the exception of tiny shrinkage cracks (see above), any foundation wall crack should be inspected by an experienced foundation repair contractor. Since structural cracks are likely to become more severe over time, get your crack inspection done sooner rather than later. Your Basement Systems dealer can take advantage of special crack repair techniques not available to general contractors. For example, our FlexiSpan® crack repair method effectively seals stable cracks that are admitting water –a repair technique that’s quick and inexpensive.